In the Netherlands, Finland, Germany, Romania, Hungary, Sweden, Denmark and Austria, some liver pâtés are shaped as a soft, often spreadable sausage, called leverworst (Dutch), pateu ( Romanian), májpástétom /májkrém (Hungarian), or Leberwurst (German). In the United States these are sometimes called "liverwurst" (mixing English and German), or braunschweiger. Some liverwursts can be sliced. In the US, sliced liverwurst is used as a sandwich filler. Others are spreadable as most French or Belgian pâté; these types are more popular in the United Kingdom. In Scandinavia and the Netherlands, leverpostej is a popular baked pâté similar to the French pâté en terrine, usually made of lard and pork liver. 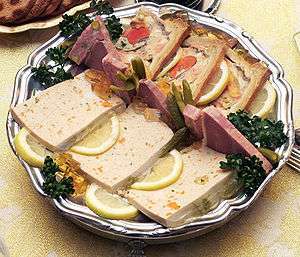 In Russia and Ukraine, the dish is mostly prepared with beef, goose or chicken liver and thus is commonly known as печёночный паштет (liver pâté) (Russian, pechyonochniy pashtet), however other meats also can be used. Unlike the Western European method the liver is first cooked (boiled or fried) and mixed with butter and/or fat and seasoning, such as fresh or fried onion, carrots, spices and herbs. It can be further cooked (usually baked), but most often is used without any other preparation. The pâté is served on bread, often with dill or other fresh herbs. In the former Yugoslavia, pašteta or паштета (a thinly pureed pâté) is a very popular bread spread usually made from chicken, beef, turkey or less commonly tuna or salmon. In Vietnam, pâté (gan xay) is commonly used on bánh mì baguette type sandwiches. Pâté of this type is more commonly made from liver. Wikimedia Commons has media related to Pâté. Look up pâté in Wiktionary, the free dictionary.